A perfect board book for the holidays, One Christmas Bear is told in rhyme. 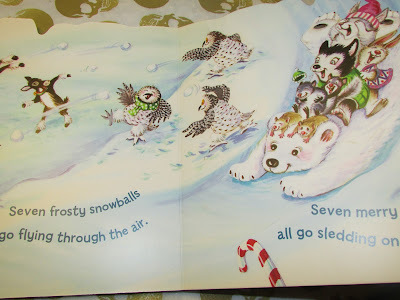 With cute animal illustrations, each page spread has a numeric progression. For instance, there's two funny foxes, three rabbits jumping, and four flying eagles. Parents reading this book to their kids can reflect on the fun things that Christmas has to offer. They can also go over number counts and point out the number of each item or thing featured. This book is short, sweet, and full of holiday cheer. 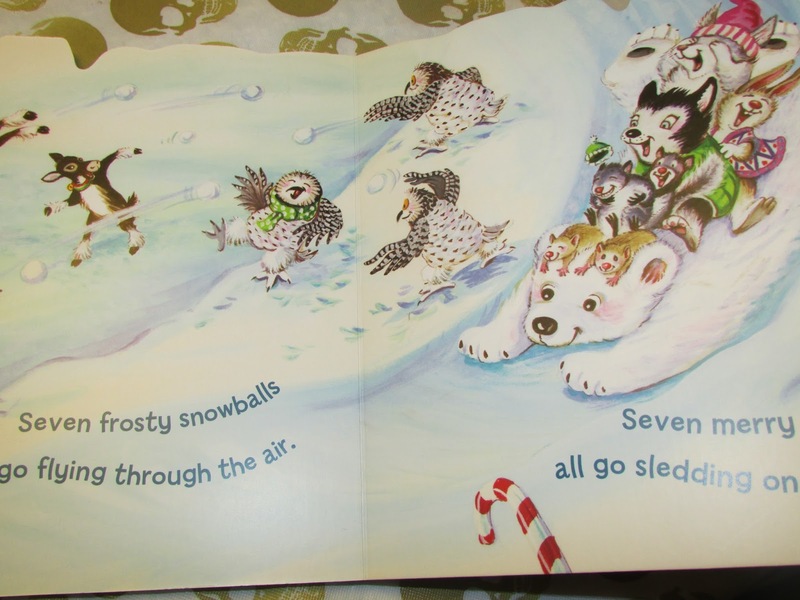 One person will win a One Christmas Bear children's board book. "Leave a comment on this blog post with whether or not you decorate for Christmas." Maybe a little sometimes! Of course I decorate for Christmas. My four year old grandson lives with me and it has renewed the child in me! So much fun! I decorate 4 tress in different themes each year. Yes we decorate for Christmas. We love decorating for Christmas and the rest of the holidays too. We have a lighted star in the window which we sometimes forget to take down the previous year. Yes :). I LOVE decorating for the holidays~! We don't decorate like we use to. We do put up a small tree and some lights outside. Yes I do but not so much this year. We are planning on moving soon, so we are just doing minimal decorating this year. yes we do and since my older son was 2 we decorate outside as well. Although, I dislike tht part because when it is time to take down it is freezing out. We decorate inside and out and start listening to Christmas carols the day after Thanksgiving! We definitely decorate for Christmas! yes, we decorate for Christmas. I love to decorate for Christmas! I LOVE to decorate the whole house for the holidays, especially for the kids! I started extra early this year...a week before Thanksgiving! Oh yes, we go all out on Christmas at our house! Yes we decorate but no big tree due to allergies and asthma. Yes, we love to decorate for Christmas. We decorate inside but not outside. I love decorating for Christmas. We had our tree up three days before thanksgiving. we don't do much decorating now that we live in a small apt. Maybe just a X-mas decoration on the front door. Em Mahr - Yes, we decorate the outside of our home and the inside. As a senior I don't any more its just to much work for me. We always went all out decorating for Christmas while raising our 5 kids and they loved to help but when they grew up and moved out and we sold our big house and purposely downsized to a teeny tiny apt that we love and became empty nesters.. we donated all our decorations to a needy family with kids and we just put out a mini table top tree and wreath and mistletoe kissing ball for the past 7 yrs. Yes, not over the top but definitely some. I do decorate for Christmas. Cute pics in this book! L love to decorate for Christmas, I decorate inside and out. Yes, we decorate! I love Christmas decorations. I love to decorate for Christmas. In fact I am putting my tree up today! We decorate inside and out - love Christmas decorations! We also love to make decorations with the little ones, and let them help decorate cookies. we will decorate inside the house. i love Christmas, it's the most wonderful time of the year. As much as possible, as early as possible! Yes, we enjoy decorating as a family! Yes, I am a decorating maven. Of course I decorate for Christmas! The decorations are already up! Yes we decorate. Our tree goes up after Thanksgiving and the lights soon after outside. Yes! I have 5 trees to decorate. It's so much fun! Yes, we decorate every year. We decorate a little bit. I have to have a tree every year. And, we hang the stockings. If we're feeling motivated, we'll put some lights up outside. No i do not decorate really, just a tree. Yes. We love to decorate but we are in need of some new decor this year. I do. I just got a late start this year. I haven't in a while but I feel the Christmas spirit this year!